Whether you are planning a private dinner party or a diner dansant, Château de la Vérie offers you a choice of meeting and private dining facilities. The atmosphere of another time, the taste of a different era, all in a carefully designed decorum ; in this refined ambiance you can make your wildest dreams come true. From a treen enlisted wedding to a discrete family meal, Château de la Vérie offers you the intimacy of her two salons with a capacity from 10 till 70 persons. 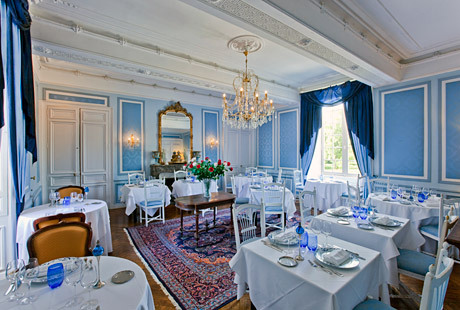 For your events Château de la Vérie has three private rooms. The blue and yellow room accommodates 20 to 24 people around a U-shape table and up to 40 people in a theatre setting. The small room is more appropriate for private dining or small group meetings and has a maximum capacity of 12 people. For certain occasions the restaurant accommodates up to 60 seated people whereas you can welcome about 60 guests for your weddings or christening parties.